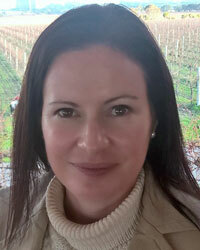 Dr Keren Bindon is a Senior Research Scientist at the AWRI. Keren has a background in biology and plant physiology, and graduated with a PhD in viticulture from the University of Adelaide in 2004. She went on to lecture in viticulture and oenology at the University of Stellenbosch, South Africa until 2008, when she joined the AWRI. Over her career she has specialised in understanding the grape to wine interface, with a particular focus on the viticultural and oenological factors affecting the concentration and extraction of grape macromolecules (polysaccharides, colour and tannin). She also works on projects seeking to identify the grape objective measures important in defining quality grade in a commercial context. Recently, Keren has collaborated on studies focusing on the production of lower alcohol wine, including the use of dilution. She has a strong interest in contextualising research to provide meaningful outcomes for the grape and wine industry, and regularly participates in extension activities. Keren will address Winemaking with high Baume juice: optimising fermentation and extraction on Wednesday in Session 10.